The PCE-VT 1100 Accelerometer is designed for quick measurements of an imbalance in machines and the examination of bearings and gears. 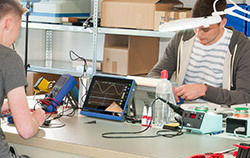 The Accelerometer is also frequently used to evaluate the state of small electronic motors. Meter can only be used for realtime measurement, no memory storage. - Needle probes: 10mm / 0.39" // 45mm / 1.77"
- Needle probes: 45mm / 1.77" // 10mm / 0.39"
The PCE-VT 2800 Accelerometer measures acceleration, oscillation speed and shift of vibrating parts, machines and equipment. The device features an integrated data logger to record vibration measurements over time. Measurement data is stored on an SD card memory and can be transferred directly to a PC via USB or RS-232 interface. The Adhesion Tester PCE-CRC 10 is designed to determine the quality of the adhesion of coatings. The Adhesion Tester is suitable for thin, thick or tough coatings on all surfaces. Since the adherence of paintings and other coatings is a crucial product and quality characteristic for their protective effect, adhesion testers are used in a wide range of industries.